Sometimes we just don't feel like fussing for dinner. That's when we bring in the big guns―pancakes! 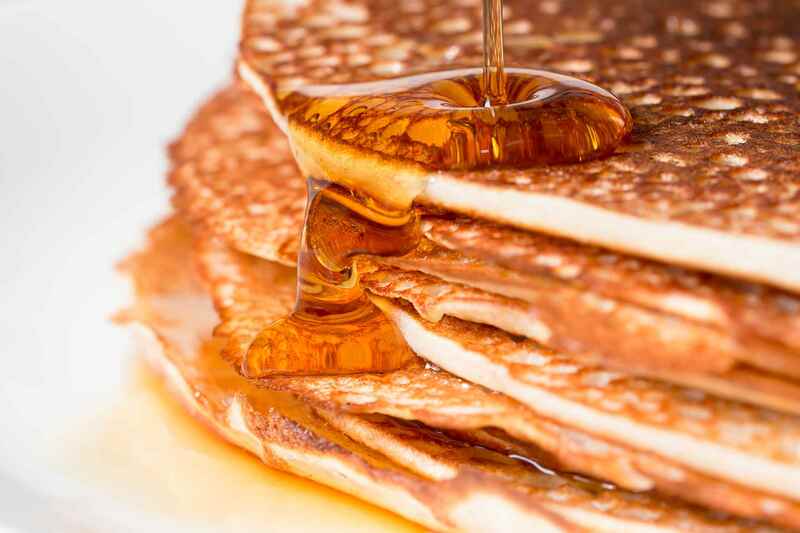 Thin pancakes, thick pancakes, pancakes with sweet toppings, pancakes with savory fillings. There's so much to like about pancakes and Eastern European pancakes come in an infinite variety. Here are some to choose from. Lithuanian pancakes are a popular treat for Shrove Tuesday along with spurgos (doughnuts). This recipe is made with white wheat flour and beaten egg whites, which makes a very light pancake. They are a silver-dollar-size and usually accompanied by honey or fruit preserves. Traditional Russian blini are made with a yeast-raised buckwheat flour batter and have a nutty flavor. Today, blini are prepared hundreds of ways―with white flour only, cornmeal, sweet, savory, you name it. And their accompaniments have gone beyond the traditional caviar, smoked salmon, minced onion, chopped eggs, sour cream and a sip or two of vodka. Polish potato pancakes (placki kartoflane, or placki ziemniaczane) are typically made on meatless days. They were thin and crispy and sprinkled with granulated sugar. Croatian-Serbian palachinke/palacinke are thin crepe-like pancakes. When they are filled with jam, fruit, or sweet or savory cheeses and rolled, they are still known as palachinke (blintzes). Polish crepes - nalesniki are pancakes that can be made thin, as in this recipe, or thick. When they are filled with jam, fruit, or sweet or savory fillings, they are known as blintzes, but the name in Polish remains the same. Hungarian crepes - palascinta are paper-thin pancakes served rolled or folded into triangles with fruit fillings, ground nuts or whipped cream. When they are stacked to form a cake, it is called rakott palacsinta. They are similar to French crepes, Polish nalesniki and Croatian/Serbian palachinke, among others. This recipe is for sweet fillings. This rolled Jewish cheese blintzes recipe is filled with sweet cheese and then fried in butter. The crepe or pancake recipe can be used for savory fillings also since there is no sugar in the batter. This recipe for Polish rice pancakes fries up crispy and light and, like potato pancakes, can be eaten as a vegetarian or fasting side dish or main meal with sour cream or with sugar. This Jewish potato latkes recipe is suitable for Passover because it is made with matzoh meal, not flour, and it comes together quickly because it's made in a food processor. Serve with applesauce and sour cream.